In 1938, Bill Monroe and his brother Charlie broke up their successful duet act, the Monroe Brothers. Throughout the 1930s, Monroe continued absorbing black and white musical traditions, closing in on the style that would become bluegrass. In 1938, Bill formed his own band, the Blue Grass Boys (named after his home state of Kentucky.) 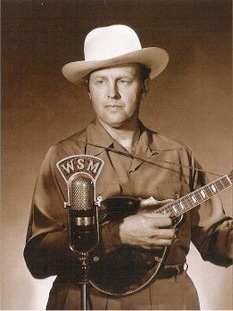 In 1939 he joined the Grand Ole Opry and was a member until his death in 1996. Bill Monroe and the Blue Grass Boys lasted 58 years and saw more than 150 different musicians pass through the band. For more than half a century, being a Blue Grass Boy was the crowning achievement of many musicians’ careers; for others, a stepping stone to establishing their own bands. But it was the group, formed in 1946—Lester Flatt (guitar), Earl Scruggs (banjo), Cedric Rainwater (bass), Chubby Wise (fiddle), with Monroe playing mandolin—that defined the classic bluegrass quintet.